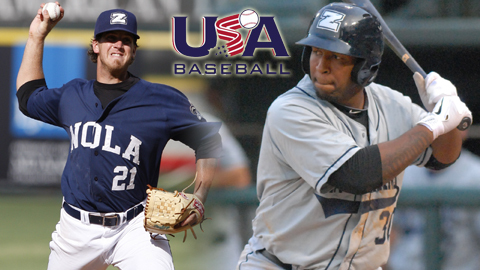 New Orleans Zephyrs pitcher Pete Andrelczyk and infielder Joe Thurston were named to USA Baseball's 2011 World Cup/Pan Am Team roster on Thursday. The team will compete in both the IBAF Baseball World Cup in Panama City, Panama, Oct. 2-15, and the Pan American Games in Guadalajara, Mexico (baseball competition to be held in Lagos de Moreno), Oct. 20-25. The U.S. roster features 24 players not currently on Major League Baseball 40-man rosters. The Chicago White Sox led all Major League clubs with three players from its farm system named to the team. The Boston Red Sox, Chicago Cubs, Florida Marlins, Philadelphia Phillies, and Texas Rangers each placed two players on the club, and the remaining players each came from one of 11 other big league organizations. "We are faced with a very unique situation this fall with two major tournaments on the schedule," said Paul Seiler, USA Baseball Executive Director/CEO. "We feel like we have assembled a strong team of both seasoned veterans and young players who are excited to represent their country. This will be the first time our professional team will have the opportunity to bring home two gold medals, and we look forward to taking on that challenge." Among those named to the team include Chicago Cubs outfield prospect Brett Jackson, who is currently ranked No. 36 on MLB.com's Top 50 prospects list. The roster also features Toronto Blue Jays catching prospect Travis d'Arnaud, who was recently named MVP of the Double-A Eastern League. Overall, six members of the team have previous Major League experience, including Brett Carroll (FLA, 2007-10; MIL, 2011), Jeff Marquez (CHW, 2010; NYY, 2011), Scott Patterson (NYY, 2008; SDP, 2008), Joe Thurston (LAD, 2002-04; PHI, 2006; BOS, 2008; STL, 2009; FLA, 2011), Andy Van Hekken (DET, 2002), and Randy Williams (SEA, 2004; SDP, 2005; COL, 2005; CHW, 2009-10; BOS, 2011). USA Baseball is also well-represented on the 2011 World Cup/Pan Am team roster, with seven players having previously worn the red, white and blue. Alumni include Jordan Danks (2007 Collegiate), Jackson (2010 Pan Am Qualifier), Tommy Mendonca (2008 Collegiate), Jordy Mercer (2007 Collegiate), Joe Savery (2005 Collegiate), and Williams (2002 Americas Series). Todd Redmond of the Atlanta Braves organization is also a Team USA alum, with 2011 marking his third consecutive USA Baseball professional team appearance (2009 World Cup, 2010 Pan Am Qualifier). Ernie Young will manage the team in Panama and Mexico, and he will be joined on the coaching staff by pitching coach Kirk Champion, hitting coach Leon Durham, and assistant coaches Jay Bell and Roly de Armas. Only assistant coach Carlos Tosca (bench coach, Atlanta Braves) does not return from the 2010 Pan American Qualifying Team staff which helped lead the U.S. to a tie for third place and qualify Team USA for both of the upcoming October events. The Pan Am Team will first gather in Cary, N.C., at the USA Baseball National Training Complex where it will train from Sept. 27-29. The U.S. will have one workout on Sept. 27, followed by the first of three exhibitions against the Canadian World Cup/Pan Am Team. The U.S. will then depart for Panama City, Panama, for the IBAF Baseball World Cup where it will look to win its third straight title. Team USA has defeated Cuba in the gold medal game of each of the last two World Cup finals. First round action kicks off on Oct. 2, against Japan at Rod Carew Stadium. At the conclusion of the World Cup on Oct. 15, the U.S. will travel to Lagos de Moreno, Mexico, for the Pan American Games baseball competition. Following two days of practice, Team USA begins play on Oct. 20, against the Dominican Republic. The U.S. last fielded a pro team at the Pan Am Games in 1999 -- USA Baseball's first club featuring professional athletes -- and will be looking for its first gold medal in the event since 1967 in Winnipeg. In the Rio de Janiero 2007 Pan Am Games, Team USA finished with a silver medal behind Cuba. The Cubans have won 12 of the 15 Pan Am baseball competitions ever played, including the last 10, dating back to 1971. The 2010 Pan American Qualifying Team is the most recent professional team fielded by USA Baseball. The 2010 club finished the qualifier tied for third with a tournament-best 9-1 record, its lone loss coming against the Dominican Republic in the single elimination semifinals. The team was led by a collection of top Minor League prospects, including Mike Trout of the Los Angeles Angels of Anaheim, and Eric Hosmer and Mike Moustakas of the Kansas City Royals, all of whom made their Major League debut in 2011. Additionally, eight other members of the 2010 team made their big league debuts this season, including Bruce Billings (COL/OAK), Tim Collins (KAN), Chase d'Arnaud (PIT), Danny Duffy (KAN), Todd Frazier (CIN), Jordan Pacheco (COL), Cord Phelps (CLE), and Everett Teaford (KAN).